Rogue One is hitting theaters, and with its release, we now have an “official” answer to how Princess Leia received the plans to the Death Star in A New Hope. In years past, however, when the old Expanded Universe flourished, there was another explanation... and it’s more complex and ludicrous than you could possibly imagine. Rogue One is set very shortly before the events of A New Hope—and, spoiler-free synopsis here, it pretty much features the Rebels learning what the Death Star is, that the plans can help them destroy it, and then getting the plans. It takes place over a matter of a few days at most. In the EU, however, “Operation Skyhook”—the plan to steal the plans after the discovery of the Death Star—began more than the two years prior to the events of A New Hope. Even stranger is how the Rebels learned of the superweapon’s existence in the first place. This takes place in the Force Unleashed video game series, when Darth Vader captures Mon Mothma, Bail Organa, and Senator Garm Bel Iblis during a meeting in the earliest days of the Rebellion and... just decides to take them to the Death Star to show it off, basically. On top of that, the senators don’t actually learn what the battlestation is capable of during their imprisonment. They only know that it exists and is under construction. It’s not until the Rebels finally confirm what the Death Star is capable of (after hearing rumors about a new Imperial superweapon) that Mon Mothma tasks Princess Leia with being responsible for tracking down schematics for the station. Kyle Katarn is briefed by a wonderfully pixellated Crix Madine and Mon Mothma in the opening of Dark Forces. The Tantive IV escapes from Raltiir to Toprawa, as shown in Empire #5. A recurring theme during the run-up to Rogue One’s release is cracking the joke that “Many Bothans died to bring you this information.” As it’s been stated countless times—even by us—that wasn’t in relation to the First Death Star. It’s the line famously uttered by Mon Mothma in relation to how the Rebels discovered the Death Star II in Return of the Jedi. But, shocking twist! In the expanded universe, many, many Bothans actually died to bring you the first Death Star plans, too. This hilarious final twist in the long story of Operation Skyhook plays out in Star Wars: Empire at War PC game, which features a mission in which players play as the Empire, and discovering that the Bothan Spynet transmitted crucial security codes for the Death Star to Alliance High Command, go to the Bothan’s homeworld of Bothawui with the Emperor himself in tow. The Emperor, along with a few of his Royal Guards, slaughter tons of Bothans as an act of revenge for the Spynet’s actions, until a sole survivor of their attack pleads for his life by revealing to Palplatine that the full plans are being transmitted to the Tantive IV in the Tatooine system. It’s the final “act” before the events of A New Hope in the EU, and it’s totally about bringing the Many Bothans joke to the Death Star 1 party too. Why the Hell Was It So Damn Complex? 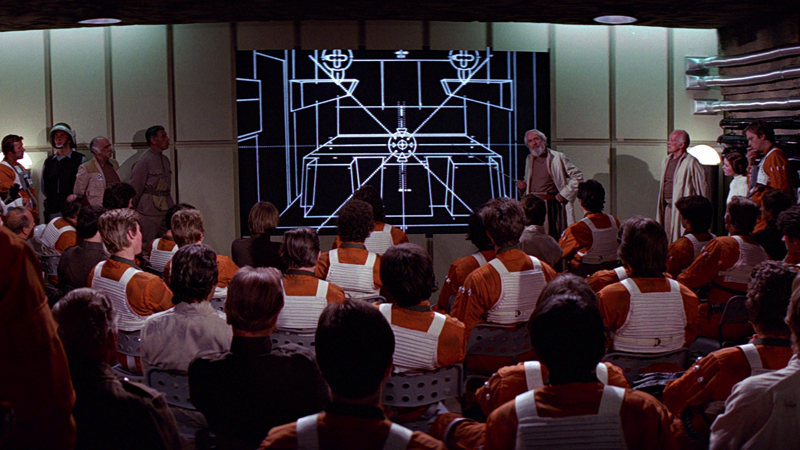 So how did the mission to seize the Death Star schematics become so achingly overwrought in the old canon? Well, partially, you have a litany of Star Wars video games to blame. “Steal the Death Star plans!” is a fantasy just like “fight at the battle of Hoth!” or “Take part in the trench run!” that has proved to be an appealing staple for countless video games, from the legendary Dark Forces (which opens with Kyle Katarn stealing the plans), to Empire at War or Star Wars: Battlefront. So many different thefts of the plans were made playable moments in these games over the years, any attempt to cohesively mush them into a single canon alongside interpretations found in the books and comics was impossible. This is partially why they were re-retconned into being incomplete documents rather than the full plans many times over. On top of that, it’s a story beat that has always fascinated Star Wars fans, especially as we never got to see it on the big screen.... until now, of course. Even the inspiration for Rogue One was simply looking at A New Hope’s opening crawl and wondering why the hell that hadn’t been made into a movie yet. The theft of the Death Star plans is a monumentally crucial moment in Star Wars history, the event that sets the original movies in motion. It’s easy to see why the Expanded Universe always wanted to go back to it and keep fleshing it out... if, in the end, they forgot to stop fleshing it out.